The concept of character is very important in all hummel products. Character since 1923 is now the company tagline (our "Just Do It"), and this concept evolved and was first developed in footwear. 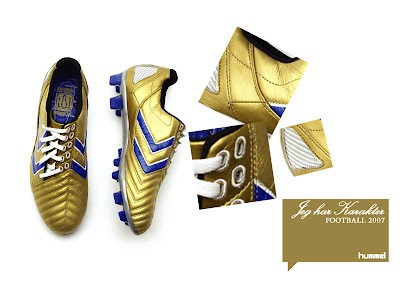 I first created the "Jeg har Karakter" concept ("I have Character", in Danish) for my first new football collection with hummel, the 2006 Collection. 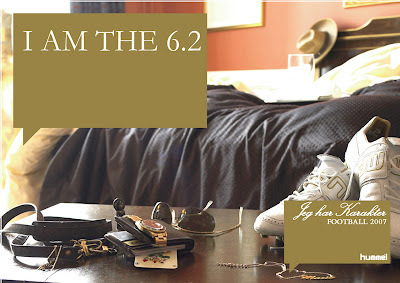 (see post here about the concept and design brief in the 6.2 Concept FG Case Study). 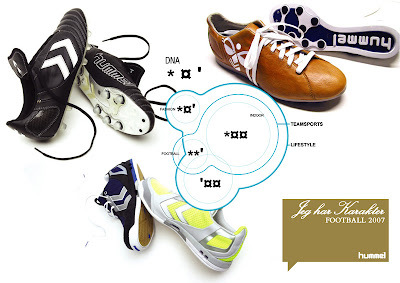 Click the Read More link below for the full story of the development of hummel Footwear Character, product DNA. As the time, the idea was to frame the collection and provide a matrix concept and reasoning for the all new models to be designed as well as a marketing strategy. The first step, was looking at the football market and competitors. 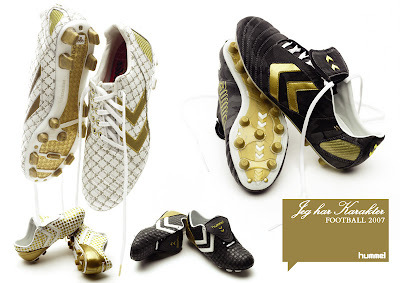 I felt it was important to attach a concept and theme to hummel football footwear products that hummel could "own". Seeing as how Adidas represented (for the most part) heritage (even though the hummel brand is older), Nike represented Technology, and Puma represented Lifestyle. As well, given the nature of our small brand compared to the Big 3, and lack of high profile players and teams under sponsorship, combined with our strategy of "non-marketing" and alternative sponsorship (ie. The Tibet National Team) a different competitve strategy was needed. The "Jeg har Karakter" concept embraced these issues. Character was something unique that hummel could bring (a alternative approach to different aspects of performance, lifestyle, and design) to the market and targeted and celebrated the individual player not the $100 Million dollar athlete. The idea was solidified with the definition of 3 different Character types that defined the product mix. The 4 Series Character is traditional, professional, respectful of the heritage of the game. The 6 Series Character is the "Rock Star", technical, but unique in personality, not afraid to be different, and connected to fashion. The 8 Series Character is highly refined, technical, focused on performance and efficiency in skill and control. Most importantly, the Character concept was broad enough yet specific to provide an open umbrella for a multi-target product approach and fit well with the storytelling approach to marketing hummel has championed for a long time. Imagine life without stories. Events only existing in the present. No recollection of our history, or dreams for the future. From generation to generation we have passed down stories since man has existed in tribes. These tribes/groups are defined by the stories they tell. Imagine stories without characters. Tales only of inanimate places, things, stuff. It is in fact the characters of our stories, and by our own character in life that we define ourselves within the groups and teams we live and play. We are all characters. We are all individuals. Characters are integral to creating excitement. In developing the hummel Football 2006 Collection, we have considered the individual characteristics of the characters present in any team. Exploring each product as a character we have combined technology, design and style to engineer a cast of unique personalities. We are all Characters. We all have Character. EVen before this character concept, one of the very first (I think I created it for a presentation about my new footwear direction given 2 weeks after I started in June 2004) and most important things I established at hummel, was the footwear DNA concept. This DNA concept describes the relationship of different products and different product categories as related with similar characteristics in design and concept. This DNA was developed to bring all footwear products closer and define a strong brand identity. Visually, you can see these in various details and patterns that are used across product categories including the rear mudgaurd pattern, rounded punched eyelets with embroidery (which has a shape similar to the shape of the "L" in hummel, rear heel window patterns. This DNA concept has been in uses on all collections since the establishment of the new footwear dept. at hummel and is evident in the design of the new 8.4 PIO FGX. This DNA concept has also been applied bringing the PIO (Per Invitation Only Concept) to sport. The 8.4 PIO FGX was the first technical teamsports product in hummel to be under the PIO label, and has now set the direction for the PIO label to be applied to all products across categories in both footwear and apparel. Taking the root idea of PIO, exclusivity, luxury, uniqueness, lifestyle and storytelling, the 8.4 PIO FGX brings these elements to our top technical boot (remember 8 Series products are focused for the technical player). 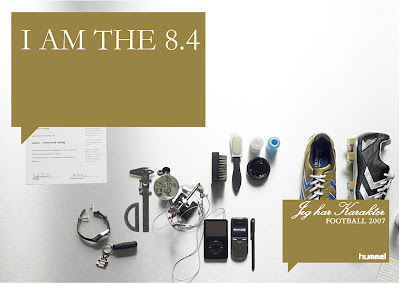 In this way, the 8.4 PIO FGX adopts some characteristics of the 6 series (Rock Star player), and links with the DNA established in other footwear categories. Likewise the 4.2 PIO FGC in camo Pittards WR100X Analine leather adopts some feel of the 6 Series (Rock Star) and 8 Series (Technical) with a unique, high performance military spec material treatment. 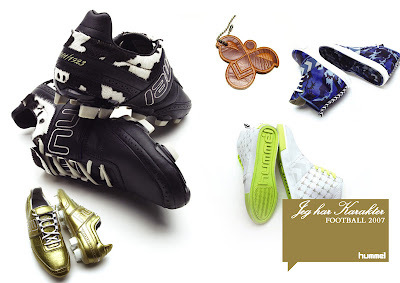 As mentioned in the 8.4 PIO FGX Unboxing post, I have been involved in more than just "footwear design" here at hummel. 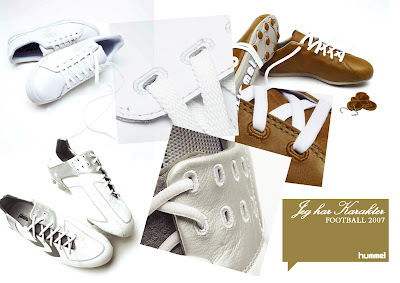 A large part of my work is the strategic design and creative direction of the hummel Footwear brand. One of the very first things I did after starting at hummel 2.5 years ago was to build up a portfolio and create a brand package for technology and performance features that are used in our footwear. Click the Read More link below for more information. The purpose of this technology portfolio was to further communicate the unique performance aspects of our shoes and create a better understanding of performance and value in the mind of our customers. 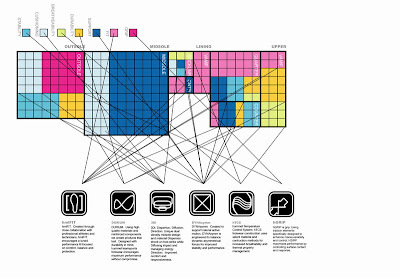 The above Technology Matrix I designed to visually communicate the idea that different parts of the shoe (ie. upper, outsole, etc.) 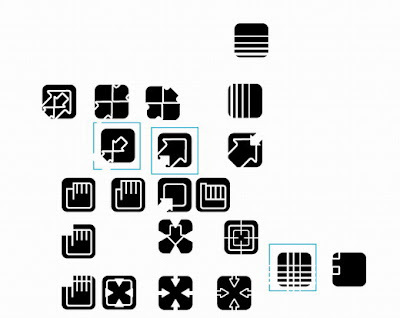 use and feature different type of technologies (ie. cushioning, breathability, etc.) Each technology is therefore tuned and focused depending on the location and application of the part/implementation. Together with this matrix, I created a series of names and logos to be identified with each product benefit. We went through lots of different ideas for names, some really terrible (ie. matress for cushioning) and others just strange (ie. TSS, Thorax Support System, based on words from a bee's body, for support). 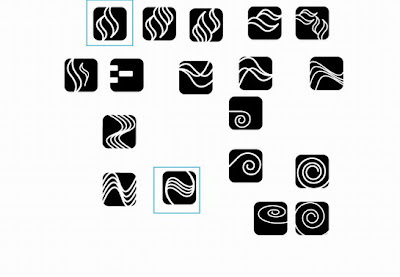 As well, the graphic icons went through several rounds of design iterations. 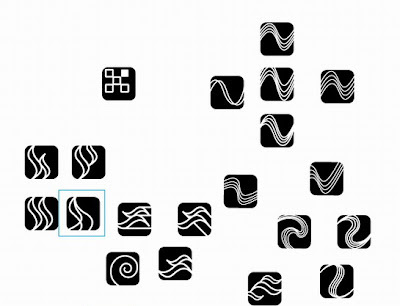 Here's some early explorations. The final logos and technology micro-brands are now used across all our technical footwear product, and some technical apparel as well. Every performance shoe includes a hangtag with the tech logos and matrix and tech logos are also incorporated into the product design of the footwear. A small point that some may not notice, but something that help make the product and the details stand out for a consumer. I am a big believer in total product experience. As such a lot of my effort here at hummel as Footwear Dept. 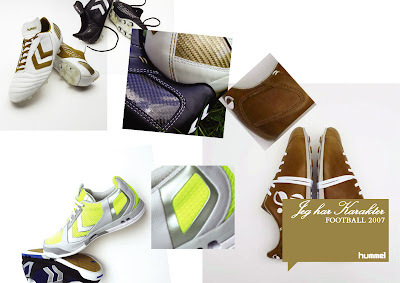 Manager has been not only focused on the footwear product, but the supplemental things that combine to create a positive experience for the consumer. This includes packaging, graphics, instructions and more. As you will see in the post below, the new 8.4 PIO FGX really presents a total branded experience and value. 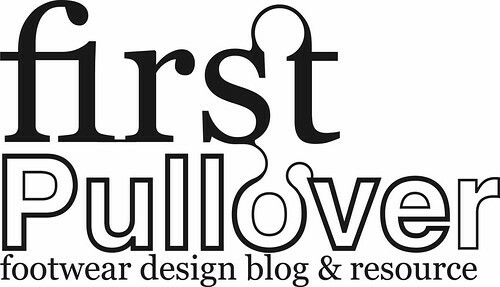 I was the designer for all product graphics, packaging and additional graphic material (hangtags, etc). Click the Read More link below for the full Unboxing (more than 30 pics and comments)of the 8.4 PIO FGX. New matte silver box design features a repeated chevron pattern I created to highlight the unique blend of performance and lifestyle character in every hummel product. Box top includes the "Jeg har Karakter" ("I have Character") logo I created and first introduced in the Football 2006 Collection. The concept (now adapted into the hummel corporate tagline "Character Since 1923") represents the unique position that hummel targets, identifying personality and Character and creating products (like the 8.4 PIO FGX) to serve these Character types. Extra performance CM EVA sockliner is included with every pair. In box sticker highlighting the revolutionary hmlFIT Customized Fit Technology heat sockliner features and benefits. Check my previous post here for more info. The 8.4 PIO FGX upper is 100% Pittards Goat Skin leather. This minibook I created (and did the Goat icon for) gives an overview of the materials features and benefits (incl. 20% higher abrasion resistance than Kangaroo leather), and also explains how to best care for your new Goat Skin leather boots (just wipe with a damp cloth and allow to air dry). More about the Goat Skin leather in a previous post, here. The 8.4 PIO FGX includes lots of hangtags that identify the many performance features and unique innovations that are included on the boot. Being a small brand, with limited marketing budget, it is important to communicate directly with the consumer about the product. Hangtags are a good way that allows the product to speak for iteself, in the absence of million dollar advertising campaigns and in a sport shop environment where the retailer may not be familiar with all technical aspects of the product. As shown, hangtags I designed included with the 8.4 PIO FGX; Goat Skin Leather, Silver hummel hangtag, hummel Technology hangtag, hmlFIT Customized Fit Sockliner hangtag and additional Pittards hangtag (provided by Pittards). 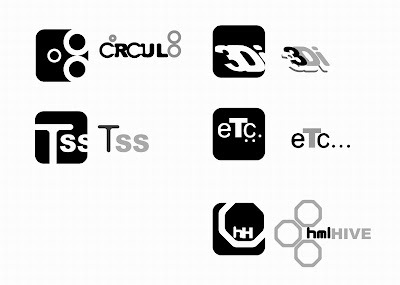 hummel Technology hangtag features 6 hummel technologies with icons, names and features graphics I created as a part of our hummel footwear branding portfolio 2.5 years ago. 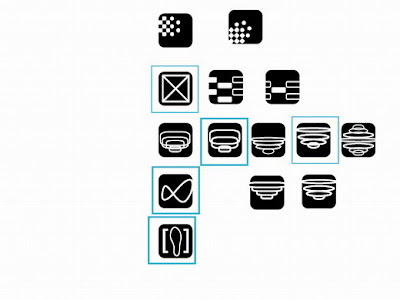 Distinct hummel technology logos and icons help identify and communicate important performance and technical features to the consumer and make highlight product unique selling points. Each pair of 8.4 PIO FGX also includes an limited edition Pittards Goat Skin Leather Bee keychain! Laser etched monogram bee upper. Be sure to check my previous post here for more pics and info about the features of this unique boot. New FGX outsole with a comination plate of traction and conical studs for superior traction, saftey and comfort. Check my earlier post here for more info. 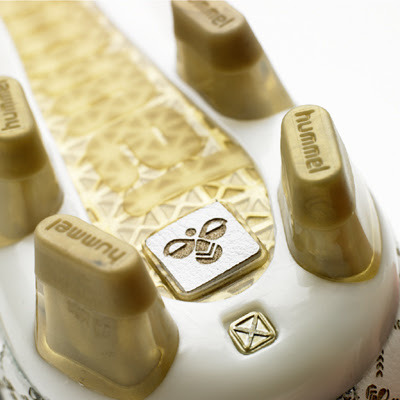 Note the nice laser etched leather detail with Bee logo on the outsole heel! hmlFit Customized Fit Technology sockliner can be molded to your feet using heat for the perfect fit. Dual density, anatomical performance sockliner has two layers of CM EVA; Black- high density for support and control, Red- heat activated layer provides fit, comfort and cushioning. Check my earlier post here about this new technology. Enjoy! The 8.4 PIO FGX should be in shops now (availability depending on market and distribution, with a recommended retail price of 220 Euro. Check back soon for lots more posts coming up about the inspiration, design and development of the 8.4 PIO FGX.